Our beautiful round serving platters are great centerpieces for catered events, banquet hall, or restaurant when you need to display your food in style. Designed to perfectly complement your other expensive cutlery and cups, our wide assortment of round serving platters serves as lovely accent pieces to your tabletops and other display settings. We offer a diverse selection of aluminum serving platters, stainless steel serving platters as well as other accessories like plate holders that will surely win you some praise from your guests and customers. Our serving platters are sufficiently deep to easily serve and display foods, and are well-suited for home and commercial use. With the availability of different designs and sizes, you will get one that suits for need in the best way. 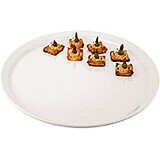 To add more grace to the display, we also offer polished chrome steel plate holder for round platters. 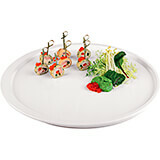 Aluminum Deep Serving Platter, 12"
The best choice for restaurants, high-volume establishments and home use. This serving platter is perfect for serve and display seafood or any other food that requires a deep dish.Measurements: 12" Diam. x 1 1/2" H. Weight: 13 oz. 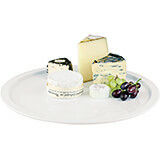 Aluminum Deep Serving Platter, 13.75"
The best choice for restaurants, high-volume establishments and home use. This serving platter is perfect for serve and display seafood or any other food that requires a deep dish.Measurements: 13 3/4" Diam. x 1 1/2" H. Weight: 1 lb. 1 oz. 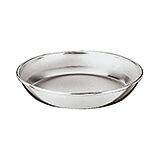 Aluminum Deep Serving Platter, 15.75"
The best choice for restaurants, high-volume establishments and home use. This serving platter is perfect for serve and display seafood or any other food that requires a deep dish.Measurements: 15 3/4" Diam. x 2" H. Weight: 1 lb. 11 oz. Aluminum Deep Serving Platter, 19.75"
The best choice for restaurants, high-volume establishments and home use. This serving platter is perfect for serve and display seafood or any other food that requires a deep dish.Measurements: 19 3/4" Diam. x 2 1/4" H. Weight: 2 lb. 10 oz. 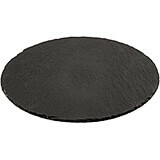 Black, Natural Slate Plate, Round, 13"
Black, Natural Slate Plate, Round, 15"
Chrome Steel, Aluminum Seafood Tray, 13.38"
13.62" X 13.62" X 2.38"
This 13 5/8 inch Paderno World Cuisine aluminum tray has high sides for containing ice and for layering seaweed to top with fresh seafood. It has a heavy rolled-edge. Chrome Steel, Aluminum Seafood Tray, 14.13"
14.12" X 14.12" X 2.38"
This 14 1/8 inch Paderno World Cuisine aluminum tray has high sides for containing ice and for layering seaweed to top with fresh seafood. It has a heavy rolled-edge. Chrome Steel, Aluminum Seafood Tray, 16.5"
16.5" X 16.5" X 2.38"
This 16 1/2 inch Paderno World Cuisine aluminum tray has high sides for containing ice and for layering seaweed to top with fresh seafood. It has a heavy rolled-edge. Chrome Steel, Aluminum Seafood Tray, 18.5"
18.5" X 18.5" X 2.38"
This 18 1/2 inch Paderno World Cuisine aluminum tray has high sides for containing ice and for layering seaweed to top with fresh seafood. It has a heavy rolled-edge. 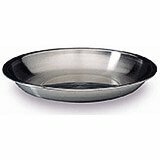 Stainless Steel, Deep Serving Platter, 12"
This serving platter is perfect for serve and display seafood or any other food that requires a deep dish.Made of 18/10 stainless steel, resists stains, rust, corrosion and has excellent luster. The best choice for restaurants, high-volume establishments and home use. Measurements: 12" Diam. x 1 1/2" H. Weight: 2 lbs. 1 oz. Stainless Steel, Deep Serving Platter, 13.75"
This serving platter is perfect for serve and display seafood or any other food that requires a deep dish.Made of 18/10 stainless steel, resists stains, rust, corrosion and has excellent luster. The best choice for restaurants, high-volume establishments and home use. Measurements: 13 3/4" Diam. x 1 1/2" H. Weight: 1 lbs. 10 oz. Stainless Steel, Deep Serving Platter, 15.75"
This serving platter is perfect for serve and display seafood or any other food that requires a deep dish.Made of 18/10 stainless steel, resists stains, rust, corrosion and has excellent luster. The best choice for restaurants, high-volume establishments and home use. Measurements: 15 3/4" Diam. x 2" H. Weight: 1 lbs. 2 oz. Stainless Steel, Deep Serving Platter, 17.75"
This serving platter is perfect for serve and display seafood or any other food that requires a deep dish.Made of 18/10 stainless steel, resists stains, rust, corrosion and has excellent luster. The best choice for restaurants, high-volume establishments and home use. Measurements: 17 3/4" Diam. x 2" H. Weight: 2 lbs. 8 oz. Stainless Steel, Deep Serving Platter, 19.75"
This serving platter is perfect for serve and display seafood or any other food that requires a deep dish.Made of 18/10 stainless steel, resists stains, rust, corrosion and has excellent luster. The best choice for restaurants, high-volume establishments and home use. Measurements: 19 3/4" Diam. x 2 1/2" H. Weight: 3 lbs. 5 oz. White, Melamine Round Serving Platter, 14.5"
The APS Paderno World Cuisine round white melamine platter measures 14 1/2" and is extremely versatile and very durable. Melamine looks just like porcelain, is extremely resistant to breakage and has a glossy finish. It is dishwasher-safe, suitable for refrigerators and freezers and resistant from -58 degrees Fahrenheit to 212 degrees Fahrenheit. It will never absorb odors or flavors. White, Melamine Round Serving Platter, 15"
The APS Paderno World Cuisine round white melamine platter measures 15" and is extremely versatile and very durable. Melamine looks just like porcelain, is extremely resistant to breakage and has a glossy finish. It is dishwasher-safe, suitable for refrigerators and freezers and resistant from -58 degrees Fahrenheit to 212 degrees Fahrenheit. It will never absorb odors or flavors. White, Melamine Round Serving Platter, 20"
The APS Paderno World Cuisine round white melamine platter measures 20" and is extremely versatile and very durable. Melamine looks just like porcelain, is extremely resistant to breakage and has a glossy finish. It is dishwasher-safe, suitable for refrigerators and freezers and resistant from -58 degrees Fahrenheit to 212 degrees Fahrenheit. It will never absorb odors or flavors.